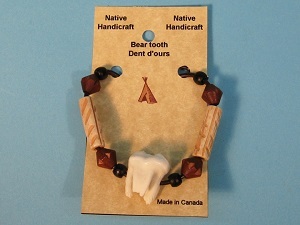 These REAL 1-Bear Tooth necklaces hang on a 19" to 19.25" (48-49 cm) round black leather strap with carved wooden beads and a real black bear tooth. 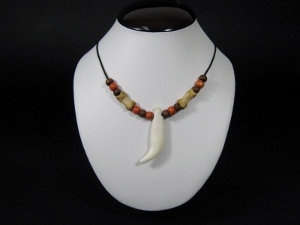 The hanging length of the tooth necklace is 11.5" (29 cm), and the length of the tooth varies from necklace to necklace. They usually range between 5 to 8 cm long. The hanging length of the molar necklace is 9", and the molars vary in size. The tooth & bone necklaces come in two styles. 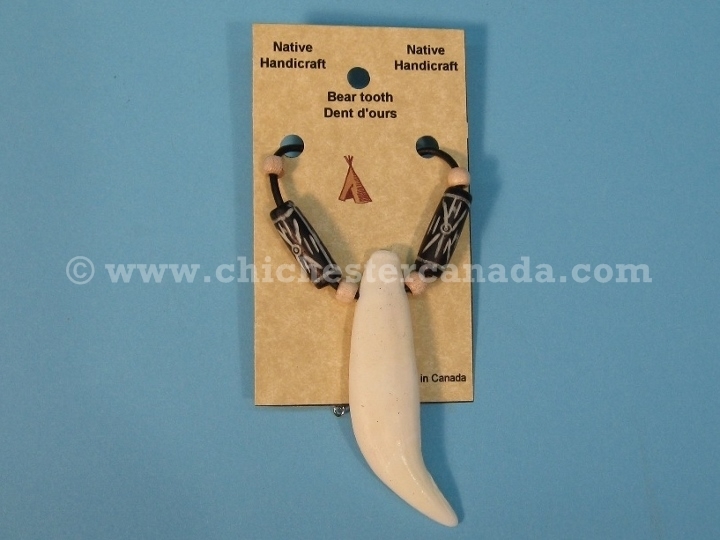 The beaded tooth & bone necklace has brown round beads, black round and oval beads, antiqued long beads, and two drilled bones measuring approximately 2 cm long. The necklace is 57 cm long, and weighs 29 grams. The tooth pendants range from 7 to 8 cm long on the outside curve. 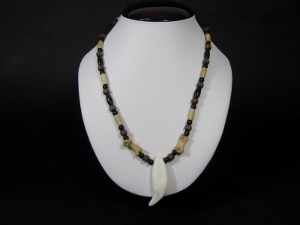 The simple claw & bone necklace hangs on a 50-cm black round cord, and has alternating round beads and drilled bone, each measuring 1.5 to 3.5 cm long. 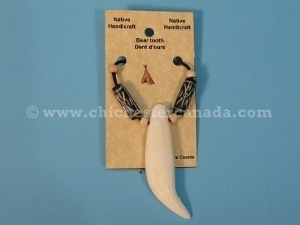 The tooth pendant measures 7 to 8 cm long on the outside curve. The necklace weighs 26 grams.